Handmade in the UK, Crystal Fantasy in our busy Bee design. 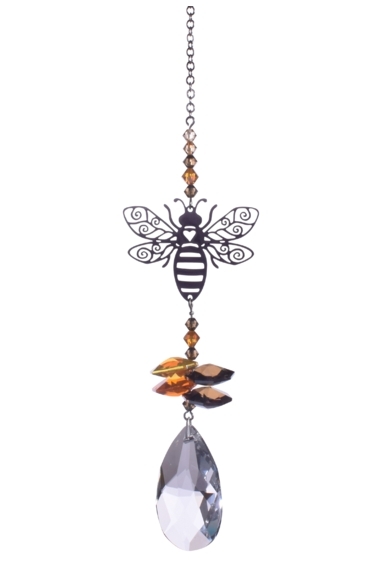 A mirror finish, metal motif is suspended between a matching bead run and crystal cascade in Autumnal Gold colourway, incorporating quality Swarovski crystals, and finished with a brilliant clear crystal pendant for maximum rainbow making effects. Here at Wild Things we are passionate about helping converve the British countryside, and with every Bee purchased, we will send out a small 'matchbook' style book of seed sticks. By planting these seeds you will help propagate bee and butterfly friendly flowers throughout the UK.